I immediately thought of Ontario’s Renewed Vision for Education. When children attend a school, their experiences should not be limited by the knowledge and skills of the adults in the building. The educators, as digitally literate, connected professionals, should be able to bring the world to the children. The school building can be a community hub for all to access the world outside the community. This concept of connected learning is well-explained in the short video below. The importance of being part of a connected world is emphasized in a recent OECD Report – Connected Minds: Technology and Today’s Learners. 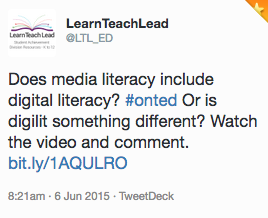 So how do we help adults improve their digital literacy? Earlier this week, HWDSB Grade 1 teacher Aviva Dunsiger led a discussion in the OSSEMOOC session demonstrating how she empowers the parents of her students through the use of technology. Aviva uses technology to share her students’ learning throughout the day, and provides parents with simple suggestions for how the learning can be extended at home. During the recent Google Education On Air Panel Discussion (14:00), Zoe Tabary (from The Economist, Intelligence Unit) reminded us that there is no “extra” time in the school day to add digital literacy. Digital Literacy learning must be integrated into the current curriculum (Sean Rush, Junior Achievement Worldwide). The recent report (Driving the Skills Agenda) from The Economist states that only 44% of the students surveyed (ages 18-25) feel that schools are providing them with the skills they need to enter the workplace, and while teachers report that technology is changing the way they teach, 77% of students report that schools are not effective in using technology for instruction. 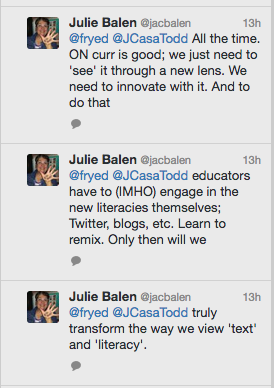 How, then, does Digital Literacy for all become an integral part of learning in our schools? If we are educating learners in our communities to be full participants in society, digital literacy must become a priority. When ever we “bring the world to the children,” we cannot help but shape that world as we see it! It’s not that we intentionally seek to do this; it’s simply impossible to keep from doing it!!! By children linking with the world, we are asking them to choose, understand, assess for appropriateness the components they see having potential. These skills will be absolutely required in their careers and personal lives in the critical lifelong learning following their formal education!!! Ah, great point! Thank you for calling me to task on that. In my past board, we often talked about “bringing the world to our students”. I really like that you challenged that perspective. I agree – facilitating the linking of our children to the world is a much more valid perspective. I am going to add this to the original post as an edit. Glad I’ve contributed to your post.